As the Seattle Repertory Theatre's literary director, part of Kristin Leahey's job is to forge a link between the works on stage and the lives of the audience. Rebecca Gilman's "Luna Gale" deals with the issues of modern foster care. Ethics and politics, issues in the social work system, and addiction are touched upon in this new work, originally commissioned for the Goodman Theatre. In the drama directed by the Rep's artistic director Braden Abraham, veteran film, television, and stage actor Pamela Reed plays a social worker grappling with the decisions that will forever change the course of a foster child's life. “It’s beautifully written and an edge-of-your-seat thriller as well,” Leahey said. “’Luna Gale’ has won every major award that it has been up for. It’s a really profound play and I’m exceedingly proud of the events that we’ve scheduled around it.” On March 12, a “Speak Up!” followed a matinee program and, with the help of the Seattle Public Library, presented a panel of leaders from the Washington organizations Families Like Ours, Amara, Treehouse, The Annie E. Casey Foundation, University of Washington Social Work, and Seattle Public Schools discussing the issues of the play related to social work, foster care, and child advocacy. Today, following the Wednesday matinee, a similar discussion was led by representatives from Childhaven and Mockingbird Society. Looking to bring a “wider and more diverse audience” into the Rep. Leahey coordinates these collaborations with local organizations. “Constellations” led to exhibits in the lobby created by the Pacific Science Center that were metaphors for themes explored in the show. For “A View from the Bridge,” the Rep partnered with the Wing Luke Museum to discuss what undocumented immigration meant in that time period and what it means today. Ayad Akhtar's “Disgraced” was another show that was “ripe for conversations and we partnered with Town Hall,” she said. A newcomer to the city, she found this season led her to meeting new people with every work. “The wonderful thing is that Seattle is a community where groups want to collaborate with each other,” she said. Another part of Leahey’s job is to find the next set of stories to create that connection. “I’m reading a script a day, at least.” Much of her time is spent looking beyond the submissions, at festivals and other locations, trying to find that next writer whose work will inspire discussions long after the curtain has fallen. 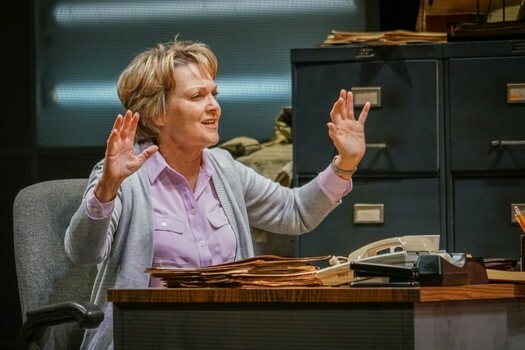 “Luna Gale” continues at the Rep through March 26. For more information on this and other events at the Rep, see their website.